I first came across Nick Grantham’s name in some of Alwyn Cosgrove’s writings, and I know that Alwyn isn’t one to lavish praise on anyone in this industry who doesn’t deserve it. Shortly thereafter, Nick and I began exchanging emails, and I came to appreciate just how solid a coach he is. I did an interview for his newsletter a few months back, and now it’s time to reverse roles and share with you a bit of what he has to offer. EC: Hi Nick, thanks for taking the time to be with us today. Please take a few moments to fill our audience in on who you are, where you’ve been, and what you’re doing now. Feel free to leave out any incriminating details, but don’t omit anything that’ll give me some firepower for busting Cosgrove’s chops! NG: First, thanks for asking me to do this interview. I guess I had a pretty standard childhood (fortunately, it was back in the day before computer games, so there was plenty of physical activity). I always enjoyed sport and belonged to my local track and field and soccer clubs, although I was never setting the world on fire with my performances. That was left to one of my older brothers, Chris, who has an annoying ability to be pretty good at any sport he even attempts. Around the age of 12, I got into Taekwon-Do, and once I got to black belt, I realized that I was pretty good! To cut a long story short, I competed nationally and internationally for a number of years, and it was during this time that I was unfortunate enough to encounter Alwyn Cosgrove! I have plenty of good stories – maybe a future e-book! Al was at University and I was also thinking about getting out of my job in insurance to go to Uni. I applied and was accepted at the same Uni as Al, which was great because we now both had a training partner and I think this was really when our understanding of the importance of physical preparation took off. Alwyn graduated a couple of years before me and set up shop in America (the rest is history – fantastic wife, beautiful house, great career). I finished my degree and went on to complete a post-graduate degree in Exercise and Nutrition Science. I began my coaching career at the Lilleshall Sports Injury and Human Performance Centre, where I worked for the British Gymnastics Team. Since then, I’ve continued to work as a strength and conditioning coach working with many of the country’s elite athletes, including Olympic and Paralympic finalists; World, European and Commonwealth Games medalists; and professionals in a multitude of sports, including netball, cricket, hockey, skiing, professional football, rugby league, rally driving, Boxing and ultra-endurance running. I’m currently working for the English Institute of Sport, a lottery funded organization that provides a nationwide network of world-class support services designed to develop the talents of elite athletes. My role is lead strength and conditioning coach for the West Midlands region and I’m responsible for the programming of 20-30 athletes from a range sports. In addition to the day job, I’m running Winning Edge Fitness Solutions (www.winningedgefitness.co.uk), a web-based venture delivering information to coaches and athletes on the latest advances in training. It’s been a real challenge, but it’s exposed me to so many great people that are out there that are working on the floor and getting results. EC: What are the main differences you see in the performance enhancement community in Europe as compared to North America? What do you feel is unique that Europe has to offer us? What do we offer to Europe? NG: The biggest difference is experience. S&C is well established in North America. Western Europe has been slow to catch up and S&C is only now starting to become a recognized career path. I think we are at the “tipping point” and in the next five years, S&C will go from weakness to strength (excuse the pun). I’ve been fortunate enough to travel through and visit some of the leading training establishments in North America, Australia, New Zealand and Europe, so I’ve a pretty good idea of what’s out there. North America – experience is the key – S&C has been around for decades and it’s ingrained in the national culture (sporting culture…not the burger eating culture). If I want to know what works over time in a practical environment, chances are I can get a good answer from a coach in the USA. I’ve always found the coaches to be very open and honest on my visits to the USA (maybe because they don’t see a UK S&C coach as a threat!). One drawback is that it’s sometimes difficult to take direct comparisons due to differences in national sports (American football, baseball, lacrosse, etc.) and a superior collegiate system. The other negative is that at times you can be a bit insular, and given that Western Europe and the Southern Hemisphere is catching up in terms of S&C, you would do well to dig your passports out and take a flight out of America to come and see some of the good stuff that is taking place overseas. Western Europe – it’s exciting times! The profession is young and that means there is a real desire to improve. It’s a bit like sport – when you are a champion there’s always someone that wants to knock you off your perch; that someone is Europe! I think there is a real passion to drive S&C forward and to begin to lead the way (let’s face it: Eastern Europe led the way for years). The diversity that Europe offers culturally translates into S&C and we have the opportunity to go to different countries and see how their system works and then take it and apply appropriate parts to our training environment. When all that is said, we can all learn a lot from each other – I know that I’ve picked up a lot of very useful information during my travels and I really enjoy sharing my experiences with coaches from overseas. EC: Very interesting perspective. Now, rapid fire: what are ten things our readers can do RIGHT NOW to become leaner, stronger, faster, and more muscular? NG: 1. Set goals – SMART goals so that you know where the journey is going to take you and how you are going to get to your destination. 2. Keep a training diary – You need to track your progress. 3. Train consistently – Set a plan and stick to it. It’s all too easy to say, “Hey, I’ll train today.” If you don’t schedule a time to train, chances are you will get to the end of the day and you will have missed your session. 4. Recover well – You’ll understand why when you read the rest of the interview! 5. Concentrate on the 98% - I’ll explain this one later on. 6. Include conditioning work (prehab/remedial/injury prevention….call it what you like….my choice is conditioning) in your training session. Superset between the main lifts – that way the work gets done and you will be on the way to becoming “bulletproof.” 7. Replace steady-state running with high intensity intervals – Come on, do I really need to explain this one? Intervals will give you more bang for your buck than slow steady-state running. 8. Don’t get hung up on TVA recruitment – Isolating a muscle will not necessarily transfer to improved core strength during athletic movements. Train how you are going to perform; make sure you hit all of the major muscle groups (rectus abdominus, obliques, erector spinae, etc.). 9. Learn to handle your bodyweight – I’ve worked with elite gymnasts – these guys are super strong. I don’t really care what your bench is if you can’t even handle your own bodyweight with good form. Don’t neglect the basics. 10. Whole body hypertrophy programmes – I’m with Alwyn Cosgrove on this one. Why go for split routines when you can get a greater training effect from a whole body hypertrophy routine? EC: You’re on a sinking ship with your entire library of resources – training, nutrition, business, psychology, lifestyle, gardening, astrology, whatever. What are the ten resources you save as the ship goes down? NG: OK, I’m not sure why I would have my entire library of resources on me during a cruise, but hey, I’ll go with it! It’s really difficult to do this and I’ve not gone into my library (actually, bookshelves in a spare bedroom) to jog my memory. I’m going with what comes to mind as a write this down. Physical Preparation Supertraining – Mel Siff (a no brainer - this is a must have – I was fortunate to see Mel present before he passed away – awesome knowledge base) Running: Biomechanics and Exercise Physiology in Practice - Bosch and Klomp (I just got this and it’s looking good) Speed Trap – Charlie Francis (not really a training manual, but there are some great insights into Charlie’s training concepts) Functional Strength Coach DVD Set – Mike Boyle (this is a must-have DVD series – 10 hours packed full of great information from Mike) Business The E- Myth - Michael Gerber (great one for anyone thinking of setting up a small business) So You Want to be a Physical Preparation Coach? – Ian King (this book helped me enormously when starting out – especially with my contract negotiations!) Fitness Info Products – Ryan Lee (I wouldn’t be doing what I’m doing right now if I hadn’t bought this product) Lifestyle The Five Major Pieces to the Life Puzzle – Jim Rohn (Great book that offers a real perspective on what’s important for success. The Millionaire Next Door – Stanley & Danko (I have this as an audio book and just loved the insights into behaviors and characteristics of the wealthy) Think and Grow Rich – Napolean Hill (tough going and one that took me a long time to get though but it certainly makes you think) EC: Speaking of sinking ships, where are most athletes missing the boat? What common mistakes do you see all the time? NG: Don’t get me started or we will be here all day! I will try to keep it brief and give you my top three: 1. Lack of consistency – So many people want a quick fix and want to see results yesterday. Newsflash: it takes time. I’m sure we are all familiar with the general rule of 10,000 hours of correct, progressive and adaptive training to be a successful athlete at the elite level. Okay, so some of you may argue that not everyone will be operating at an elite level, but the general rule still applies; you need to do your time before you can expect to get some payback. There are no shortcuts and one of my favorite quotes is “The only place where success comes before work is in the dictionary.” Think about it! 2. Being too clever - People trying to be too clever and thinking that innovation should always mean advances in technology or the like. Sometimes, innovation can be adopting a very simple approach. I was recently listening to Vern Gambetta speak and he summed it up with this quote: “Everyone is looking for the 2% that is going to make a difference – but what about the other 98%?” All too often, we worry about the small things when we don’t even have the basics under control. You have no right to be doing the clever stuff until your have the 98% covered – and don’t forget it has to be done consistently. I think your Magnificent Mobility DVD is a great example of taking care of the 98%. Please don’t be offended, but what you deliver is a simple-to-use resource. The content is proven, it’s not fancy, it’s not clever, and you don’t need the latest piece of kit to perform the drills. It takes care of the basics – that’s what will boost performance. 3. Poor Recovery – It’s all about training and what takes place during the 1-2 hour training session. The majority of people neglect what happens during the other 22 hours! You don’t improve from training; you improve by recovering from training. This is an area that I’ve been looking at for the past 18 months and I guarantee that if you take care of the fundamental rules of recovery you will see your performances in the gym and in your sport go through the roof. I’ve recently pulled together a heap of recovery information into a single training manual and I’ve put together the “recovery pyramid” that guides you through the myriad of different recovery strategies available. For more details, check out www.recoveryregeneration.com. EC: Right on. I’ve read the e-report and it’s very thorough. Moving on, what does the future hold for you? Where is Nick Grantham going to be in five years? NG: More of the same, I hope! I always find it difficult to predict where I will be in 5-10 years. Back in 1992, I was working in Banking and Insurance, five years later I was graduating from University, five years on from that I was working with a national squad preparing them for a major World Championships. I honestly wouldn’t have predicted any of those major events! I’m really enjoying what I’m doing at the moment. The day job is fantastic; I get to work with some great high-level athletes in a tremendous working environment, and the website stuff is an exciting new area. I hope that whatever the future holds won’t take me too far away from what I really enjoy – and that’s coaching. The new ventures that are starting this year are very exciting and I think that the UK is just on the verge of taking off in terms of getting the S&C message out to wider audiences; hopefully, I will be part of that movement. Moving away from work, I hope the future will bring some additions to my family; my daughter Erin needs some playmates! The short answer is, who knows what I will be doing in five years? I’m not too bothered, as long as I have my family and friends around me to share the experiences with (it would be very dull otherwise). EC: Feel free to shamelessly promote your products and services here. I’ll just sit back and give a cyber “thumbs-up” as you go. NG: Well, Eric, the website has been name checked a few times! The first two products to come out from Winning Edge Fitness Solutions are two in-depth reports. Recovery and Regeneration - The Essential Guide to Training Hard Without Falling Apart gives readers access more than 20 pages packed full of the latest information on recovery and regeneration. Vibration Training - From Space Exploration to Fitness Club is a slight departure from the norm, and I know I’ve had a dig at people being too clever! However, like it or not, vibration training is big news and it’s important that you are up to date with the background information because you need to be able to be able to answer your clients questions on the latest advances in training technology – and they will be asking! The big thing you will then need to do is work out if it falls into the 98% or the 2% - but one thing is for sure: if you don’t have the information, you can’t make an informed decision. Other than the e-reports, I’ve got some exciting collaborations with two companies in the UK that are looking to establish a series of seminars throughout the UK (keep an eye on the site for my speaking schedule), as well as some possible joint ventures including a tennis-specific conditioning manual. EC: Thanks, Nick. Where can our readers find out more about you? NG: Thanks for having me Eric. If your readers are interested in reading more about me or they simply want to take a look through my archives, then they can check out www.winningedgefitness.co.uk. We run a free weekly newsletter packed full of training advice and regular features. If your readers have any questions, they can also e-mail me at nick@winningedgefitness.co.uk. It's Halloween, and as you're reading this, I'm down in Georgia for baseball stuff. Because I'm actually writing this on Tuesday night, it's hard to get in the mood and be spooky, but I'll do my best. 1. I'll be doing a LOT of baseball seminars over the next few months: November 8-9 (NY), December 14-16 (TX), January 30 (MA), and February 14 (MA). For more information, check out my schedule page. 2. I actually think the Fat Tax is a good idea. While we're at it, can we institute an a**hole tax for guys who curl in the squat rack? My girlfriend was lifting at a gym down in Southern CT this week, and she told me a guy took up a squat rack all morning to do three curl variations - and then proceeded to set up two bars in the rack to do dips. 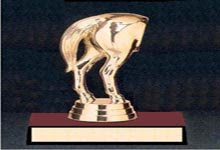 The good news for him, though, is that the Horse's A** trophy he receives partially offsets the tax. 3. When dealing with athletes post-ACL reconstruction, it's obviously important to get range-of-motion back quickly. However, the direction of that ROM can actually tell you quite a bit about what is going on. When someone is struggling to get knee extension, the problems are usually do to scarring. Flexion problems, on the other hand, are usually related to graft tensioning issues. In other words, when there is loss of flexion, it is usually surgical. When there is loss of extension, it is usually rehabilitative. 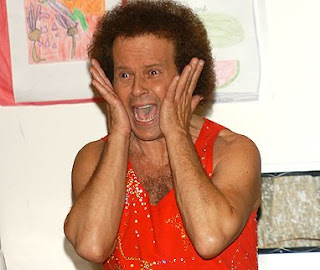 When there is a loss of both flexion and extension, the problem is - you guessed it - Richard Simmons. Yes, he's spooked, spooky, and stupid. I don't want your trick or your treat, Richard; I just want you to put some pants on and get a haircut. 4. Scientists recently confirmed a virgin birth in a shark. Apparently, the baby shark (called a pup, for reasons I can't explain) carried no male genetic material. Immediately upon its birth, the shark started bitching about how it didn't want to get too bulky. Scientists fear for the pup's survival, as it refuses to swim fast enough to catch its prey because it doesn't want to get out of the "fat burning zone." 5. I went into quite a bit of detail on why I dislike the term "shoulder impingement" in my newsletter this week. Check it out HERE. Just five this week, as I've got lots to do. Have a great weekend! Can You Gain 5 Pounds of Muscle per Month? 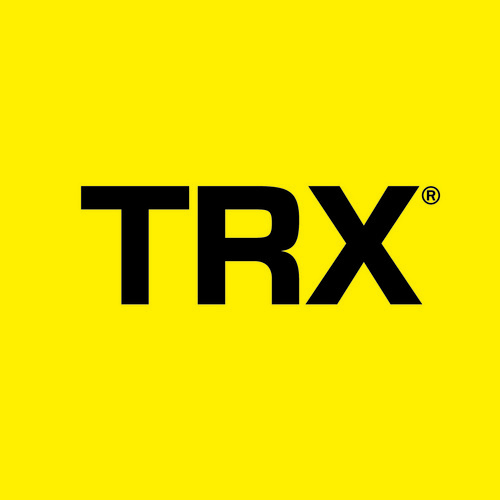 I just received this email from a happy Maximum Strength customer: “I just did my post-testing two weeks ago after the Maximum Strength Program. I thought you might want to know the results: OLD Lifts | NEW Lifts Box Squat: 315 | 345 Deadlift: 365 | 385 Military Press: 160 | 175 [note from EC: I guess he opted to test this instead of his bench press] Chin-up 3RM (total system weight): 200 | 210 Bodyweight: 175 lbs | 195 lbs I am very happy with the results. Thanks a lot! Ashiem" 20 pounds in four months? That's five pounds a month! Not too shabby at all... Buy Maximum Strength now. Q: A lot of strength coaches and athletes (myself included) utilize variations of the box squat. I've heard other strength coaches (one in particular) indicate that it does not fully stimulate/activate the piriformis. What are your thoughts on the issue of the box vs. free squat in terms of advantages and disadvantages? I currently utilize both variations however it would be nice to be able to articulate to an individual the pros/cons. A: I don't buy it. For one, the piriformis is a tiny muscle that is typically very overused. I wish we could get more people to calm it down and used their glutes for the majority of the work! Second, box squats are one tool in your toolbox; we use them in addition to a lot of other lower extremity exercises. In fact, they're an integral part of the Maximum Strength program. Nobody ever criticized chin-ups because they don't target the gastrocnemius - but that doesn't mean that they aren't useful for what they're intended. Additionally, I haven't seen any EMG studies to show the piriformis argument is legit. Let's just say that I had my worst point total (79) of the year - yet still managed to defeat Tony. I was already up 53-49 going into Monday Night's game, and Reggie Wayne, LenDale White, Bo Scaife, and Adam Vinatieri didn't do much for me. So, you could say that I beat Tony with four fewer players. 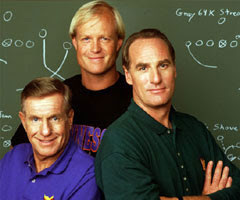 Effectively, you could say that Tony's fantasy football managing strategies are as stupid as THIS. Didn't that must make you a little bit dumber? The good news is that our baseball training seminar in early November in Long Island is going to be videoed, so you can pre-order the DVDs now. I consider myself very fortunate to not only have a good-sized newsletter list, but also to have such a knowledgeable collection of readers who share some awesome feedback with me. After last week's newsletter on the current status of the fitness industry, I got this great email from Nick Beatty, and he agreed to let me reprint it here, as I think it's right on the money. "Eric, "Thanks for your sharing your insightful anecdote about your and Mike's experience at the shoulder presentation. I agree that personal trainers could and should attend these education events, but the lack of trainers in the room speaks to a bigger problem- the very definition of what a personal trainer is and how you become one. "Case in point, where would the sponsors/presenters of the event advertise in order to increase trainer attendance? Within university departments? On journal websites? At GNC and sports clubs? At your local bodybuilding competition? At yoga studios? At your local YMCA? At the tanning salon? "The bar is set low for trainers, so to assume the lowest common denominator and expect a high-school educated personal trainer to comprehend (and more importantly contribute to) a lecture by a professional group that requires an undergraduate degree, followed by a terminal degree in physical therapy, is unfair to the trainer. So who fills the post-rehab gap? Will it be the good trainers, or a special certification (i.e. one in particular rips you off in order to call yourself a post-rehab expert) that gets lots of trainers to that point, or will Dr. Mike Jones and his MES/AAHFRP expand? Who knows, but as long as the gum-chewing dude spotting lat raises is allowed to call himself a Personal Trainer- the industry is screwed. "I recently left my personal training job in NYC to hit the books again, and some of my thoughts from my exit interview echo your sentiments: What didn't you like about Company X? "Regarding my dislikes, it is difficult to to determine whether they are related to Company X or to the industry that Company X is in. Company X operates on a level that is better than most companies in the industry, so it is my guess that the things I dislike about Company X are either because of the industry, or because of the nature of the business. "I dislike personal training, and by that I mean I dislike the whole concept of a 'fitness professional' and what goes along with that. There is no licensure for 'fitness professionals,' only certifications. The high-school drop-out who eats steroids for breakfast and independently trains; the ex-athlete who trains from experience; the certified (insert cert here) trainer who trains at a gym; the highly qualified trainer; the physical therapist with a CSCS; the yoga instructor in a leotard and sneakers at the CEU event; the fitness enthusiast with a website, product, or podcast: ALL these folks are 'fitness professionals.' It is no wonder the public and the profession itself doesn't know what to make of personal training. There is a serious identity crisis in personal training, and until it's addressed, LMTs, PTs, and all other allied health professionals will be better respected- and paid! Best, Nick" Nick Beatty, MS, CSCS, ACSM HFS, is a personal trainer in Manhattan and medical student at the New York College of Osteopathic Medicine. Feel free to drop him a line at nick@hpdp.org. I'm headed down to Maryland today for my longtime friend Greg's wedding. It'll be quite a car ride, but luckily, I've got my girlfriend to keep me company. Of course, I don't know why any of you would care, but I was a little short on introductory content this week, so you had to put up with my senseless rambling. Sorry about that. 1. Speaking of Greg, I'm happy to say that I'm at least partially responsible for him being a stud in his tuxedo this weekend. You see, Greg did my Maximum Strength program over the past four months, finishing two weeks ago. Here are his pre-post numbers: Weight: 205 to 193 Broad Jump: 81" to 93" Bench Press: 245 to 275 Squat: 245 to 295 (Greg is coming back from a knee surgery last year) Deadlift: 275 to 315 3-rep max Chin-up: 250 to 263 (total system weight) His friend Bill did the program with him, and he proved to be another example of a guy who can either maintain or decrease his weight while still improving strength appreciably: Weight: stayed at 170 Broad Jump: 91.5" to 105" Bench Press: 275 to 300 Squat: 315 to 335 Deadlift: 365 to 405 3-rep max Chin-up: 260 to 285 (total system weight) Pretty soon, when he does chin-ups, Greg will have to also include the ball and chain around his leg in his total system weight calculations. Zing! 2. I've come to the conclusion that it kind of weirds me out when people email me and address me as "Coach." To be honest, nobody around the facility calls me "Coach." And, if the people I see in person all the time don't call me Coach, why should people I don't train call me that? I mean, do I look like any of these guys? While we're at it, I'm not a fan of being called "Bro" or "Comrade." And, the word "Yo" is stupid and really 1990s. 3. This isn't really what I had in mind with my focus on unstable surface training, but it's amusing nonetheless. 4. 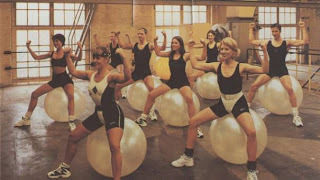 Speaking of unstable training surfaces, you see what happens with you swallow your bubble gum? Commit that to memory, kids. 5. Someone asked me earlier this week if for someone needing extra scapular stability work would find value in doing 1-arm DB punches flat, incline, and even overhead for the serratus anterior rather than just doing them solely on a flat bench all of the time. My response was that I actually think it could potentially be worse to do it on an incline or decline. The decline would encourage a bit more scapular anterior tilt (emphasizes pec minor over serratus anterior), whereas the incline might actually irritate an already-angry shoulder injury. So much for innovation! 6. My newsletter for this week focused on the state of the fitness industry. At risk of sounding overconfident, it's definitely worth a read. 7. I had the best steak of my life on Tuesday night. For those who haven't been, definitely check out Abe and Louie's on Boylston if you are ever in Boston. It was pure, succulent, dead cow bliss. If you're a vegetarian, sorry - but you can at least take solace in the fact that the asparagus and broccoli sides were pretty good (especially since they were drenched in steak juices). 8. While on the topic of steaks, I cooked up some moose meat earlier this week - and it was great. I'm from Maine, so it's not THAT weird-sounding to me. The secrets are to a) use a lot of spices, b) not overcook it, and c) try not to think about how it was carved on the back of a pick-up truck until after you've eaten it. *For the record, I resisted the urge to post a picture of a hunter posing with his rifle in front of the moose he'd just shot. I figured I'd upset the vegetarians enough already with random thought #7. 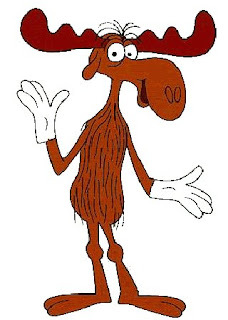 So, I'll just upset the kiddies and cartoon fans by saying that I ate Bullwinkle. We just have eight thoughts this Friday, as my mind's on all the travel I have to do and programs I have to write. With all our pro baseball guys rolling or in the process of getting started, there are a lot of logistics to which I am attending. I'm psyched for a great off-season, and we'll have plenty of blog video content for you along the way. In the meantime, have a great weekend. "Unstable surface training is many times misunderstood and misinterpeted in both the physical therapy and athletic performance fields. 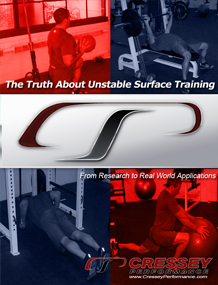 The Truth About Unstable Surface Training e-book greatly clarifies where unstable surface training strategically fits into an overall program of injury prevention, warm-up/activation, and increasing whole body strength. If you are a physical therapist, athletic trainer, or strength training professional, The Truth About Unstable Surface Training gives you a massive amount of evidence-based ammunition for your treatment stockpile." Shon Grosse PT, ATC, CSCS Comprehensive Physical Therapy Colmar, PA Click here for more information on The Truth About Unstable Surface Training. Mark Comerford made a really good point last weekend when he was talking about differentiating between neck and shoulder-related upper extremity pain. In many cases, the symptoms are very similar. For instance, both labral problems and cervical spine impingement can cause numbness into the lower arm. And, both rotator cuff tendinopathies and tears and cervical spine issues can refer pain to the medial border of the scapula. Comerford noted (and it holds true in everyone that I've seen) that when you have something from the cervical spine (neck), weakness is greater than pain. Conversely, if it's a problem of shoulder origin, there is generally more pain than weakness. Simple, but I've never heard of anyone actually put it out there. Smart dude. Keep your shoulders healthy for the long-haul with Optimal Shoulder Performance.